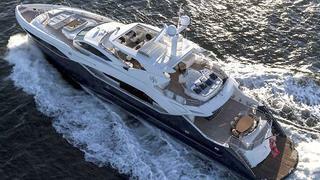 Word comes from Fraser Yachts that they have signed as Central Agents for the sale of superyacht Never Say Never. Never Say Never is a Sunseeker Predator 40m launched in 2011, built under the supervision of an experienced owner and captain. She accommodates 12 guests in a master suite on the main deck, and two double staterooms and two twin cabins with Pullman berths on the lower deck. She also features a beautifully finished Ken Freivokh designed interior, has never been chartered, and is in immaculate condition. Twin 3,460hp MTU engines (with an extended warranty) take her to speeds of 26 knots. Lying in Newport, Rhode Island, Never Say Never is asking $15.5 million.